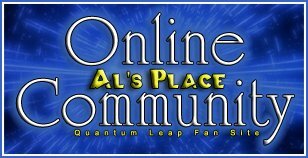 Dec 11th interview with Scott Bakula -- filming in 2007? Hey everyone, after reading this post and doing some searching of my own I found another site with details about BLF. It states that the project is still in development and lists a premiere in July. I was just wondering if anyone had seen this before and what they think. Here's hoping at least some good news comes out of all of this. my brother asked if there had been anything in Variety or tHR (as someone previously asked). I told him that it it had, all of our google alerts would be going off. you know what this suddenly reminded me of? The Beatles getting back together. Well, I was willing to give the download a try. But it is not a recognized file extention. So....no download. It opened Limewire in the background. Having watched and listened to many interviews and having spoken with Scott in person, I stand by my original statement. The quote simply does not sound like Scott. All your points have turned me, i'd probably say it's fake now, the lack of sources and stuff has foiled me, but The Bartender has the final say for me. BTW: The page has been updated with a new paragraph instead of the 'quotes'.... i'll check it properly now. *Update*: The stuff with the quote and all that has got the chop. This has been replaced with a very loose paragraph about a 50/50 chance of it happening and that Scott Bakula and Dean Stockwell are available but nothing is confirmed. I am Wishing really hard no matter how long I must wait. What I want to know is why would anyone...do such a thing? I do hope it is not a prank and it is all for real. Dreams still come true...right? I haven't heard back from Jay yet, but since the page has changed already, it's obviously not true. Looks like a mean hoax put on us all. Again. At least it wasn't the sci-fi channel doing it this time lol. The way the page is written now (or the last time I looked at it), it's just wishful thinking, and it's wrong. Now it's about a new TV series rather than a movie. But Dean has said in an interview that he's not available for a full-time role in any series (Battlestar Galactica Magazine #7). He said he would be happy to do a movie though. Since the page has changed, I wouldn't be surprised if Jay gave us his answer already by doing the behind the scenes work to make the quote go "bye-bye". What's there now sounds extremely legal and PRish. Unfortunately, they do this because we're easy prey. Not us QL fans in particular, but devoted fans in general. We're easy to stir up, and there are probably people who take a sadistic delight in getting us hopeful, then watching our hopes get crushed. It's why I don't trust anything I read until it's official. I'll hope that something is true, but I just can't trust it. Yes I do agree with you on this one. Trusting every thing that is put out is dumb of me. I am learning the hard way of why I shouldn't trust what is only a rummer and not fact or afficial. But I will still keep the hope that some day they give us our moive. I can't see why they wouldn't? You and me both! I'll hold 'em down while you wallop them!!! Grrr!!! Way to play with a man's emotions. Oh well, at least I have season 5 intact and BSG. Last edited by alsplacebartender; 12-30-2006 at 10:05 PM. Reason: harsh language - watch your language! We are upset by this, but please keep the language to a minimum. The part that really fires me up is how eloquent this hoax puller tried to be. That's just really low. Sorry if any were offended. I do not find the gd word over the top when expressing frustration. I respect any who may feel otherwise. Again sorry and here's to hoping we get some real news concerning the future of our beloved show. There's nothing on the IMDB about it. I remember doing a search on that database a while ago, and there was something about it. It seems to have disappeared. So, once again, we were lied to. If you check the bit at the bottom out the page was last updated (copyright wise) in 2005, so may not be valid now and kinda pointless to add to. Let's just hope some real info turns up soon. Yeah man, need this thing to happen. Television is utterly useless these days.